The "Silver Bullet" in the treatment of thrush, white line and hoof rot is now available in a convenient gel formula! Safe on skin and hair. Bacterial growths such as rain rot on horse legs are eliminated with one application. Will not dry or irritate raw flesh. A skin protectant gel with glycerin and Dioxicare. 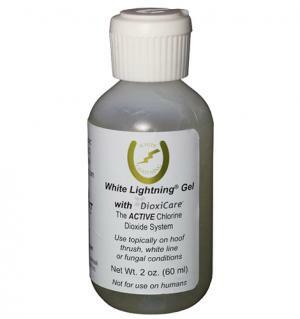 White Lightning® product is made specifically as a broad spectrum first aid system for skin. Helps heal dry, chapped skin and soothe chronic irritations. The Gel version of the highly effective liquid White Lightning®. For the treatment of White Line Disease, Thrush, Scratches, Rain Rot and other skin fungus. 1. Clean the area, trim hair, remove dirt, etc. 2. Liberally apply to affected area completely covering the area. 3. Protect from rubbing, etc., so that the area stays covered for 6 - 8 hours. Two or three treatments should provide noticeable improvement. 1. Remove shoes and trim the hoof as necessary. 2. Scrape out affected area with a knife or pick. 3. Liberally apply gel in problem area. 4. Cover with shoe. If barefoot, substitute shoe with duct tape or similar covering to allow gel to remain in place for 6 - 8 hours. Always expel old product from mixing tip as it is inert after 8 hours. Never draw back on 14 ml plunger as tube will contaminate by cross - mixing components.